and left the Saskatchewan side of Cypress Hills Interprovincial park on Gap Road connecting the east and west block of the the park. This road is not for the faint at heart, and it is only passable when it is dry (I had to go through the truck wash in Maple Creek and left 45 pounds of mud behind). Don't even think of bringing a trailer or motor-home down this cow trail. Needless to say we did not go the same way back. This White Tail Buck, just stood there and looked at us. Good part of Gap road. However it is very beautiful and full of wild life. Lots of White tale and Mule Deer like the one in the above pictures. We also saw and heard one doe (female deer) that came out of the bush, she stomped her hoofs and said, "That's the last time I do that for two bucks"..... sorry, Liz made me do it. The land between the two blocks are privately owned so please stay on the trail. Once in the west block which is both in Saskatchewan and Alberta there is lots to do and lot of land to cover. The Cypress Hills area spans over 125 kilometers from east to west through some wonderful country full of rare fescue grasses, lodge pole pine and white spruce. It is also home to ranching families, charming resorts, welcoming towns and of course Canada's only interprovincial park. Further, you can also find Saskatchewan first and only Winery, "Cyperss Hills Vineyard and Winery where you can enjoy complimentary wine tasting, self guided vineyard tours, unique gift shop and home made Saskatoon berry pie. The park is home to Fort Walsh and the Cypress Hills Massacre. Fort Walsh was established as an RCMP post to get peace between the whisky traders and the Assiniboine Natives that were the people involved in the massacre. The story has it, that on the 1st of June 1873 a group of whiskey traders attacked the Assiniboine camp. In doing so they killed several women, children and braves in retaliation for the alleged theft of their horses by natives. Many Assiniboine Natives had already died from the fatal whisky, which was laced with ink and strychnine. 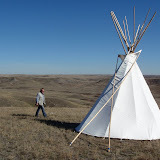 The park has so much more to offer and if you travel through southern Alberta and Saskatchewan, you must stop and camp (or book in to a lodge) here. The campgrounds are plentiful with or without services. Check out www.CypressHills.ca Note: Some areas of the park, like into Fort Walsh you will not be able to pull a trailer, the switch backs are too sharp, but there are trailer drop off areas. After touring a portion of the park we turned the GPS to Maple Creek, did the truck wash, walked the town and talked to some locals. Had a coffee at the "Daily Grind" and picked up some supplies at the local Co-Op store. Once back in the east block of the park, we picked up our trailer and headed west on Hwy 1 to Medicine Hat. From there we took Hwy 3 to Bow Island and Taber. From Taber, 36 south, 61 east and eventually ended up in Magrath and parked our brigade at Covered Wagon Campground. Great place but somehow the Internet was not what it should be. Magrath is a quaint little town and you can see some wind generators with the Rocky Mountains as a back drop. Tomorrow we are off to Waterton National Park.